From Ivy League classrooms to Wall Street boardrooms, healthy overachievers are using a steady stream of “smart drugs” to keep up with their demanding daily routines. But abusing prescription medications isn’t smart. Now there’s PROFIDERALL… Scientifically engineered to help increase focus, improve concentration and boost energy… without a prescription. College students have been using "smart drugs" to improve mental performance for years, and these habits are now graduating into the workplace. This new generation of young professionals sees cognitive enhancers as an important tool for success, and now many older Americans are seeking ways to improve their focus and function, and not get left in the dust. PROFIDERALL’s Cognitive Energy Complex™ is the first to pair clinically supported nootropics with powerful stimulants to provide intense focus and incredible energy in a single power-packed “Smart Pill.” Using the power of nootropics, PROFIDERALL “zooms you in“ so you can ignore distractions and focus at work… at school… at home. BOOST ENERGY: PROFIDERALL delivers an incredible burst of energy that takes effect within minutes and lasts up to 6 hours. SHARPEN FOCUS: PROFIDERALL delivers the neurotransmitter GABA directly to the brain… stimulating cognition while decreasing anxiety and stress. 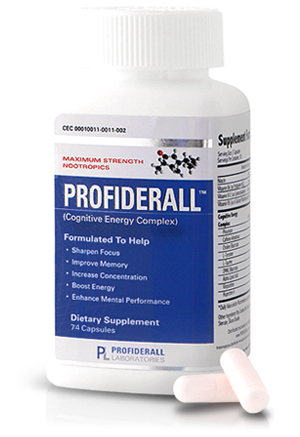 IMPROVE MEMORY: PROFIDERALL increases neurotransmitters in your brain so you can think clearly, process more data, and retain more information. INCREASE CONCENTRATION: PROFIDERALL "zooms you in" so you can ignore constant distractions and concentrate on the task at hand. ENHANCE MENTAL PERFORMANCE: PROFIDERALL "wakes up your brain"... giving you the ability to work smarter, work longer, and accomplish more.